Microsoft is trying to psyche out the shortened url market by launching its innovative new “longer url” url lengthening service for its relaunched search engine Bing called Binged.it. Typing Binged.it into a browser however takes visitors to Bit.ly – one of the top url shorteners on the web. With Google having recently launched its own url shortener, it was inevitable Microsoft would launch its own shortener. Its also natural a url shortener market leader like Bit.ly would be driven into the arms of its new enemy’s (Google) enemy – Microsoft. Now playing on a screen near you – The Attention Wars. 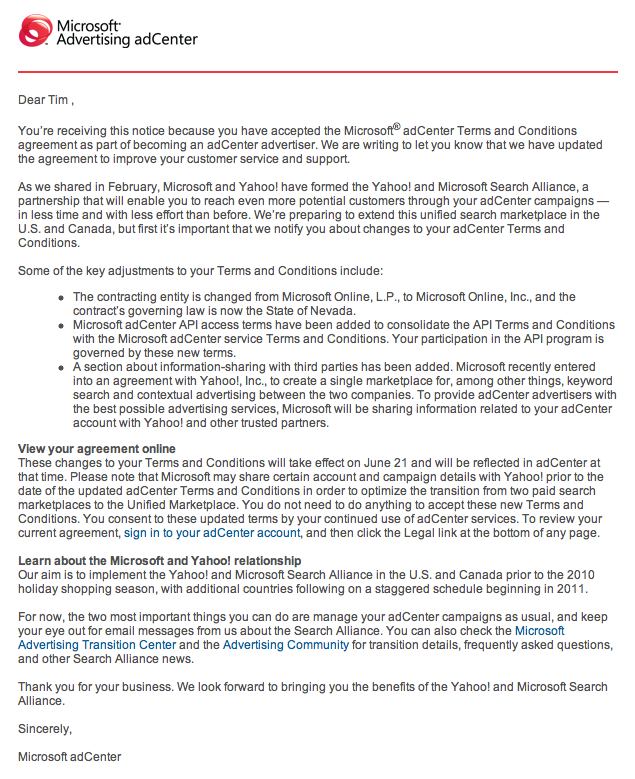 Some time ago I wrote a piece characterizing Microsoft’s offer to buy Yahoo as their attempt at reinforcing and fortifying the habits of computer users to remain on Microsoft owned property. Not because Microsoft needed Yahoo for additional desktop market share but because Microsoft needed Yahoo’s search audience share and still does. Microsoft doesn’t want to lose any more attention, audience or keystrokes to their now main strategic rival and desktop franchise threat – Google. I also thought Microsoft’s offer was dubious at best – offering just enough money to get everybody’s attention including half Yahoo’s board of directors – but not enough in the end to cause Co-Founder Yang to surrender his baby. The whole act was really a masterstroke on Microsoft’s behalf. Because as we all now know, Yang was excommunicated for not agreeing to sell while Microsoft also got to add the latest chapter to their Embrace, Extend and Extinguish playbook. Anyway – as the web has matured every large internet property has become visitor retention focused – ie., motivated to retain what audience and attention they have. Hence, the recent introductions of new web homepages for each of the three largest internet audience properties – Google, Yahoo and Microsoft. In case you hadn’t noticed, each property has recently introduced a more sticky homepage. Google has introduced their “fading” home page. No links are shown on the page until a user mouses over the links. The Google home page links “fade in” only after a cursor moves onto the page. This may not seem like much of a change, but over the course of a day and with it 100s of millions of users – the amount of additional time spent collectively by visitors on the Google home page will increase. 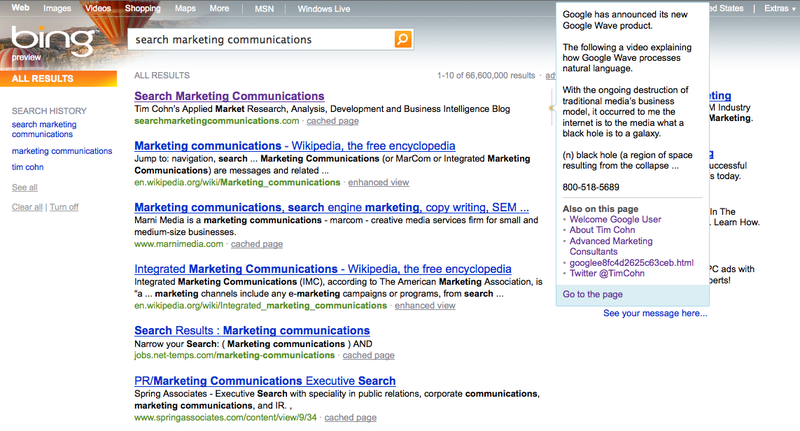 Even before Bing became Bing, Microsoft had added an eye catching image to their homepage with several pop up boxes throughout the image to capture and retain searchers attention. I am not sure what direct branding effect this will have on the Bing brand, but it will definitely increase awareness and recall for each of the images featured on their home page. Yahoo moved “My Favorites” to their home page’s left rail in the hopes of both increasing their users attention and keystrokes. I suspect Yahoo’s efforts will achieve both. Expect to see every media company with a screen presence whether on the world wide web, television or mobile phone going to ever greater lengths to try and capture the growing more elusive with each passing day audience’s attention. Yesterday, Microsoft announced plans for new visual search feature additions to their Bing search engine. Bing plans to roll out image based searches later this year via Bing’s Visual Search Galleries. 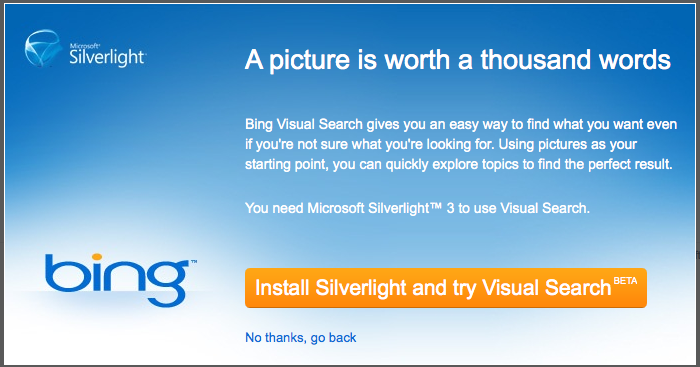 Microsoft’s visual search promise comes with one seemingly large caveat, prospective Bing visual search users must first install Silverlight before they can view Bing’s visual search results. If having to install an application before searchers can get a search product to work isn’t a friction generating barrier – I don’t know what is. As most everyone in the search industry already knows, yesterday Microsoft and Yahoo reached a long anticipated and rumored search pact. Because of the capital costs of maintaining a competitive global search engine, search engine market consolidation was inevitable. I have commented about the Microsoft Yahoo search opera on several search industry blogs and wrote a blog post back in February 2008 about the real reason Microsoft needed to do a search deal with Yahoo : Microhoo vs. Google: The Battle for Audience and Keystrokes. 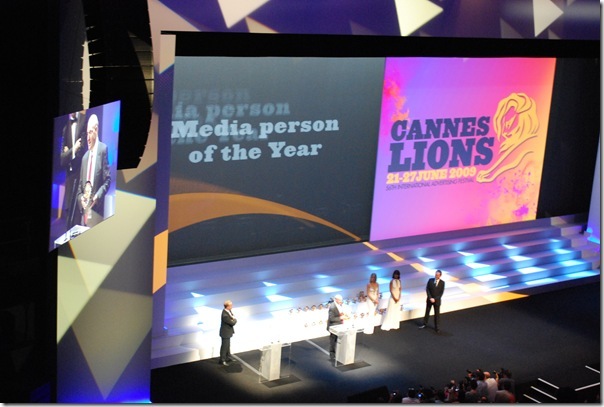 The Cannes Lions 2009 56th International Advertising Festival has named Microsoft CEO Steve Ballmer its Media Person of the Year. All content consumed will be digital, we can [only] debate if that may be in one, two, five or 10 years. There won’t be [only traditional]newspapers, magazines and TV programs. There won’t be [only] personal, social communications offline and separate. In 10 years it will all be online. Static content won’t cut it in the future. Some say that the ad-funded model has not led to profitability. Google’s search site makes money but past Google is there a publisher with an ad-funded or fee-based model that has made lots of money? No. We have no interest in acquiring Yahoo. What we have said is that we will continue to remain open to a partnership with Yahoo. As we all know by now, Microsoft has launched its highly hyped new search engine called Bing. Instead of gushing about Bing the product’s attributes or shortcomings, I instead will concentrate on its one glaring strategic flaw – market positioning. According to Search Engine Land, in developing its marketing and advertising campaign to position Bing as a “decision engine” among other things, Microsoft relied on its own limited perception of what searchers wanted from a search engine ie., Microsoft’s own limited internal search data. Having a myopic self view of a market may work in segments where your products enjoy an effective monopoly like say desktop software. However, extrapolating a markets wants and needs from a subset of the search audience can ultimately only produce an incremental increase in search market share at best. Experienced search marketers understand the differences between the Google, Yahoo, Bing (Live) and even AOL search audiences. Apparently the same can’t be said for the search technology team at Microsoft, I guess that’s why they work at Microsoft. Microsoft+Yahoo+Twitter = Microhooter! to the Rescue? While thinking about commenting on another blog regarding all the blather about how this company or that company will kill Google and its lead in the search space, I believe I stumbled upon the perfect Google killer: Microhooter! Combined or by reputation alone couldn’t Microsoft’s desktop monopoly, Yahoo’s display ad business and Twitter’s mass texting be enough to derail Google’s money making search engine? Maybe in theory but not in practice. No, not even Microhooter! will save the day. The search audience is an army of one – one billion people online that is – an army which will continue to march where it can find and get the answers it needs when and where they are needed. With or without a Microhooter, for the time being and for the foreseeable future that place will remain Google. Based on today’s search traffic, it appears the recent gift giving season keeps on giving (problems) to those fortunate enough? to have either received or bought themselves a Microsoft Zune over the holidays. I can only guess the three Zune search phrases that don’t indicate a Zune problem were queries ran by possibly frustrated new Zune owners who hadn’t yet realized they were in need of Microsoft Zune Support. If you are having problems with your Zune, click through to Microsoft Zune Zupport.